Frankie is a jumping fool! Last weekend was the DOCNA trial in Pinetop. 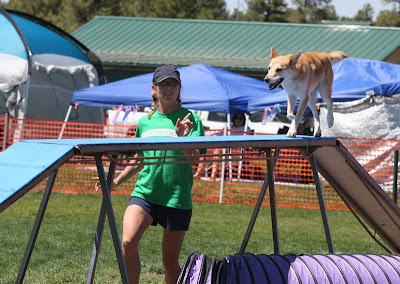 I love going to Pinetop for agility trials. It's like a little vacation. Pretty location, good friends, good weather, a chance to get away. All of my agility friends stay at the same place in the cutest little cabins. We have a BBQ there on Saturday night. It's a really good time. We got to Pinetop around 7:00 on Friday night. 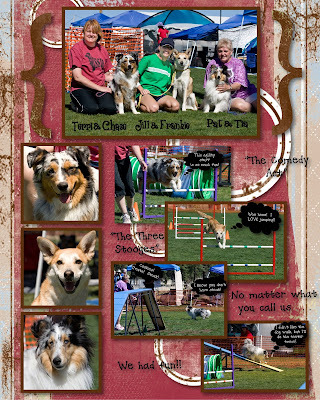 After setting up my agility stuff and getting dinner, I had time for reading and cuddling up with my dogs. Yay! I don't have a lot of time to do that at home. It was nice to get a chance to relax. At the trial, Frankie was at his best and worst this weekend. His worst included being up to his old shenanigans again - running around like a man on fire for many of his runs. 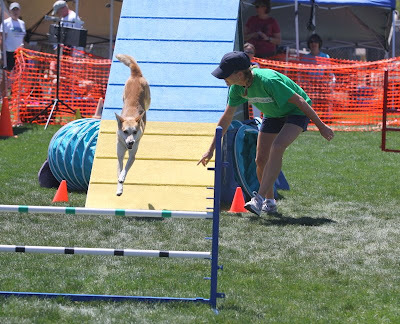 He even had a Frankie-First - he ran out of the ring in the middle of his standard run. I couldn't believe it. Ergh. One of the fun highlights of the weekend was Trigility. 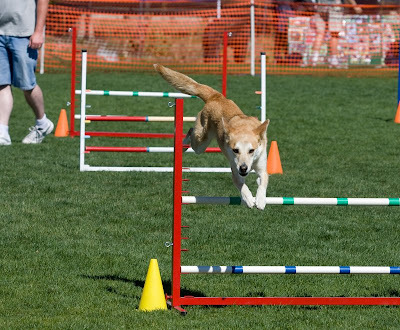 Trigility is a 3-dog team event where a course is divided into 3 sections and each dog does a portion. All 3 dogs have to do their runs correctly to get the Q. I don't usually enter Trigility because I don't want to let people down with Frankie's unpredictability. But my friend Terri has a brand new pup, Chase, and another lady we know (Lady-Pat, as not to be confused with Husband-Pat) also has a pretty green dog, Tia, and they were willing to try it if I was. We entered with very low expectations for a Q and very high expectations for hilarity. Our expectations were met! Surprisingly, both Frankie and Chase did their runs with no faults. Frankie's portion included a call-off of a tunnel that I didn't think we'd get since he's a major tunnel-sucker. He was supposed to go over that red jump and turn to the blue jump by where I'm standing. You can see him heading for that tunnel, but he actually listened to me (because I was screaming in a really high pitched squeal) and came over the blue jump. Miracles do happen! And lots of people were laughing. Lady-Pat wasn't as fortunate with Tia. Tia would NOT go on the dogwalk for nothin'. She did take the teeter twice though to make up for it. :) Lots of people were laughing some more. Vickie made this cute collage commemorating our first NQ. Agility makes you tired. You should curl up in a ball and go to sleep. On Sunday I finally convinced Pat to take us home via Mesa instead of Payson. It was so pretty. I love Arizona. And I love rocks. Mostly I just love rocks in Arizona.